Holly Ross thinks she’s just about got her life in order. She has a fabulous job at the National Museum of Fashion and wonderful fiancé Allesandro, but it’s all about to come crashing down. Having started life a bit roughly and still dealing with a father who is more than a little unconventional, it’s no wonder that Holly lives her life like an Audrey Hepburn movie as much as possible. Picking up the pieces of her life proves to become a wacky adventure- perhaps not very Audrey Hepburn, but very much Holly Ross. Holly Would Dream had an interesting story once I got into it, which admittedly took a little while. It was an easy read, chalk full of cheesiness, but Karen Quinn does a good job of making the impossible seem possible in this novel right through to the end and keeps the pace moving quickly. It was an amusing single girl read but I found it often tried a bit too hard with it’s snappy quips and Holly’s thoughts sometimes didn’t seem to fit with my impression of the character (but that could have just been me, Kathryn didn’t seem to notice this). The Audrey Hepburn references didn’t overwhelm or confuse me as I’m not a huge fan and have only seen a few of her movies, so this was a nice surprise because I thought I might get bogged down in a lot of detail. Overall, Holly Would Dream was a pretty good read. It not one of my favourites though and it probably didn’t help that I read it after Twenties Girls so my opinion might be slightly skewed. 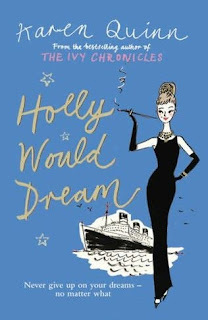 At first I wasn’t sure I was going to enjoy Holly Would Dream as I found it a bit disjointed in the beginning - of course that could have just been me! There seemed to be many different characters and I was a bit overwhelmed. However, they soon sorted themselves out and I got sucked into the story. The Audrey Hepburn theme throughout the novel was great. I’m not a super fan so I’m sure a lot went right over my head but I did know enough to really find it fun, so if you have no clue about Audrey Hepburn this book is still worth reading! The character of Holly is endearing in her obsession for the perfect movie ending, but she obviously doesn’t get her movie story line exactly as she expected. The story was well written and enticed you to want to continue flipping those pages until the end. I also enjoyed the movement in the story where we were sent off around the world which kept it from being stagnant. Holly is hilarious, her father is even better and the cast of friends and foes was fabulously alive!